The Orioles do not have a fantasy superstar stud closer but their closer situation is more stable than a lot of teams. Jim Johnson has been a consistent performer but does not get the strikeouts that owners and lets face it - most Major League Managers - want to see in their bullpen ace. Johnson would be a great closer to pair with a high strikeout non-saves reliever such as Jacob McGee. But until Johnson starts to falter there is little reason to worry about the rest of the Orioles bullpen. The Orioles have quite a few young pitchers that could work their way into the majors (or back there) through the bullpen but none of them are likely to compete for saves in 2013. The Red Sox are one of the teams that have shown interest in Brian Wilson. A Wilson signing would create even more chaos in a bullpen that has shown little stability over the past few seasons. Hanrahan had control problems in 2013 and has had them in the past. Frankly with the exception of the 2010 and 2011 season he has always had shaky control. It was that lack of control that led to him becoming a Pirate in the first place.It would be a poor idea to bet on Hanrahan regaining his 2011 BB9. However the Red Sox bullpen is loaded with intriguing candidates for saves. Bailey has also had inconsistent control numbers but not quite as bad as Hanrahan. Bailey has had more problems staying healthy and available. Tazawa was excellent in 2012 and is probably the most likely to become a stud closer of this group. Unfortunately, Tazawa will probably have to wait for both Hanrahan and Bailey to fail first. Until 2012 Mariano Rivera was easily the most consistently great closer in the game. He is almost certainly a Hall-of-Famer and one of the greatest closers of all time. This is the first season in over a decade that Rivera enters with anything less than great expectations. At this point Robertson is clearly Rivera's successor but Joba Chamberlain (if he proves healthy) will attempt to make a case for himself this season. He has the stuff he just needs to go do it. Chamberlain is a nice sleeper for saves in 2014 as he should come very cheap and provide value in any case. Phelps is likely to be a Jack-Of-All-Trades for the Yankees pitching as the long reliever, spot starter and Joba insurance. The role could hurt Phelps stats but he has nice skills. He is better drafted in leagues where he can be stashed. Fernando Rodney should be as close to a lock to regress to his career numbers as any pitcher listed in this article. He had an amazing, once in a lifetime season that is miles from his career levels. The Rays may be great pitching instructors and they have put together a great bullpen but they are not miracle workers. Rodney is much closer to a middle tier closer than the best closer in all the lands. The pitcher to own in this bullpen is McGee who has great numbers and will eventually have to be considered for the more prestigious bullpen roles. Casey Janssen has been very good the last two seasons and has proven more than worthy of holding the closer role indefinitely. Janssen did undergo successful surgery on his right shoulder to repair lingering AC joint soreness. While this is not expected to delay his start to Spring Training or the season it does create enough of a question to provide Santos owners a glimmer of hope. But Santos is himself coming back from much more serious shoulder surgery and until we actually see that his stuff has not changed he is a tough investment. Esmil Rogers was quite good once he escaped from Colorado. He has the stuff, strikeout rate and Ground Ball rate to be a very successful pitcher. With the two favorites adding recent shoulder surgery to their resumes, Rogers could be a nice low-risk investment. Addison Reed had to fight through the crowds of contenders to earn the closer role. He has the stuff as shown by his stellar minor league statistics but has not quite reached his major league potential to this point. Reed has the potential for a much higher k-rate which would shoot him up the closer ranks. For now he should be the stable holder of the closer role for a team in the midst of restructuring. When a team attempts to rebuild on the fly it can be very difficult to judge what they will do in certain situations. So while there should be optimism regarding Reeds ability to improve, there should also be caution in investing in the bullpen of an unpredictable team. Lots of analysts suggested it was time for Perez to give way to Pestano in the 2012 fantasy guides. At Advanced Fantasy Baseball we experimented with a different idea. With the closer position in constant flux we suggested that owners consider low investments in the closers that no one wanted or that were being projected to lose their jobs. Perez was the successful side of this idea, Frank Francisco was at the less successful end. Still, Perez had a nice season. It could be that Perez improved as a pitcher and the control gains are for real. More likely, it was a one year anomaly. For now Perez holds the job and should be considered fairly stable in the position. The Tigers are insisting they have no interest in adding a veteran closer. They further insist that they would like rookie Bruce Rondon to take the closer role. He has the the strikeout stuff though his control is not great. He could thrive in the role but rookies with less than 150 innings in the minors rarely come up to dominate in the majors. The Tigers have had some success with moving prospects quickly through their minor league system. They have also had some spectacular failures in this department. The bet here is on Benoit who is probably the best pitcher in their bullpen. Greg Holland stepped up and eventually filled the closer role for the injured Joakim Soria and the traded Jonathan Broxton. Holland's strikeout rate almost makes up for his lousy control but fantasy owners will not enjoy his high WHIP. Kelvin Herrera could be a much better option. Herrera has it all. He has the strikeout rate, excellent control and a great ground ball rate.Herrera is good enough to be worth drafting in deeper leagues even without the possibility of saves.If the Royals regain faith in Herrera's health they could potentially place him back in a starting role where he would have frontline pitcher stuff. The Twins are in re-building mode so anything can happen. Glen Perkins is solid in all areas and should be a competent closer for the Twins and would retain some value even without the job in deeper leagues. Burton would probably be as good as Perkins at closing but his chance depends on Perkins failing since he isn't likely to be drastically better. The Twins have acquired two power arms this winter that could be future power closers - Trevor May and Alex Meyer. Both are still being developed as starters but the Twins have often broken in starters as relievers. At this point no one outside of the Astros front office has any real idea who the 2013 closer will be. Veras is probably the favorite as the most experienced pitcher and a veteran minor league closer. He is in the high strikeouts/high walks mode, his WHIP will be on the high side. "If you're going to take a chance on someone to be a first-time closer, that's the type of guy you want," Porter said. "We do have other pitchers that will get an opportunity to pitch late in the game, whether it's [Rhiner] Cruz, who had a really good winter league, or [Hector] Ambriz. There are others who will get a look, but Veras has the experience right now and is the front-runner." Josh Fields is another power option.He is a Rule V pick from the Boston Red Sox. His control has improved the last two seasons in the minors and he could be a nice closer. Cosart is still on the starter path but has been mentioned by the Houston front office as a potential closer. At this point he looks like a mediocre starter so the bullpen may be his opportunity to shine. Madson is coming off Tommy John Surgery and could potentially miss the first two weeks or so of the season. When healthy Madson has great stuff with excellent command. The fact that Madson may miss a few weeks gives Ernesto Frieri a boost in value. Frieri owners should hold him if they have him at a low keeper cost. Frieri does not have great control but his real problem in 2012 was an elevated HR/FB. If his HR/FB regresses back towards his career rates he should be an excellent option in 2013. Scott Downs as ever is the Angels insurance policy in the bullpen. The Angels seem reluctant to ever actually give him the closer role but he is usually the guy they turn to when they need to lock things down. 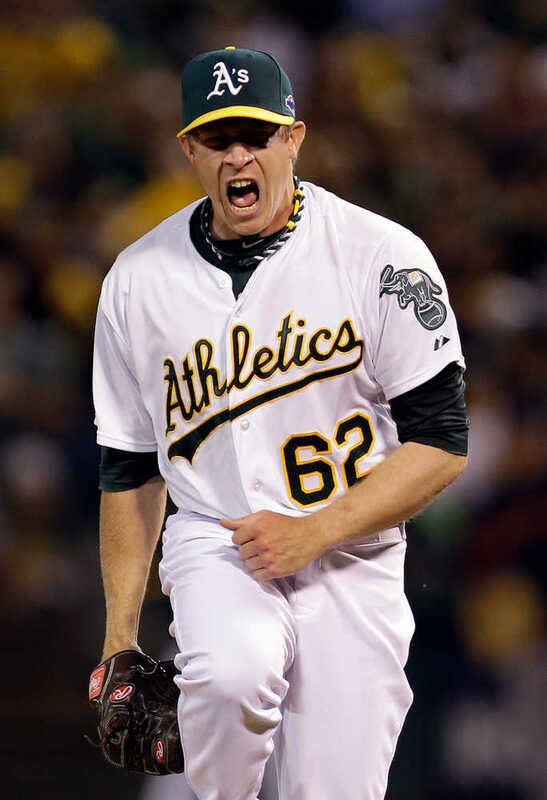 There is really just one pitcher that you should be looking for in the Athletics bullpen and that is Sean Doolittle. He was drafted with the 41st overall pick as a first baseman but knee injuries almost ended his career. The A’s converted him to pitching and rushed him through the system in 2012. From Class A to the Major Leagues - 17 games, 26 innings, 1.04 earned run average, 50 strikeouts, 8 walks. He has a very deceptive delivery and a blazing mid-90s fastball. He could stabilize the A’s closer position for several years. Wilhelmsen has a great story and was a huge success for the Mariners this season. He gets a decent number of strikeouts and has decent control as well. He induces a bunch of groundballs and his 2.89 FIP says he earned his 2.50 ERA. You might wish Wilhelmsen had a higher strikeout rate but other than that this seems like a pretty stable closer situation. Carter Capps rampaged through the Mariner system using his moving upper-90s fastball and slider. He performed well in his first stint in the majors and should only improve with experience. Capps seems to be the clear closer of the future. Stephen Pryor does not have the same sort of stuff as Capps but he too marched from High-A to the Major Leagues in 2012. He gets nice strikeout numbers but his control is pretty shaky. The Mariners have a ton of young arms that could contribute to the bullpen this season as the Mariners advance talent through their system. Joe Nathan completed his return from TJS with the Texas Rangers in 2012 and looked almost as good as ever. The strikeouts were there. The command was there. He did not seem to suffer much in the more hitting oriented environment. As he nears 40-years old, Nathan can be expected to fade a bit but there are not many signs of that in his 2012 statistics. Scheppers allowed a few too many homers in his first Major Leagues stint but he has the stuff to be the Rangers closer of the future. Joakim Soria was signed this offseason after the Royals declined to re-sign him as he rehabbed from TJS. Soria is expected to be ready by the All-Star Break and while he contribute in the second half, he is more likely to be of value in 2014.